I am Negan. Are you Negan? If not, you might get a sad ending. The cult leader has instilled in everyone in his following that they are one unit and they are no longer their former self. They all take on the name Negan and shake in fear when they hear the REAL Negan speaks, commands and or in some cases get angry and kill. He kills without mercy and in the most gruesome of ways. 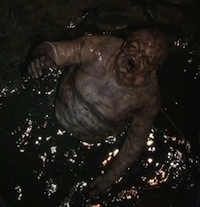 He has no sympathy and is the evil of the evils in The Walking Dead. He takes on the wives of the husbands in his cult and the husbands have to do what Negan says otherwise he or his wife will get killed. His weapon of choice is his bat which he calls Lucille and she’s always thirsty for blood. He’s killed many times including when Rick’s group of people were all kneeling in a row in front of Negan, Negan almost killed Carl but killed Glenn and Abraham with a swing of his bat. He treats all his leaders with respect and gives them food, a room to enjoy and maybe the pleasure of hanging out with his many wives. Negan also trapped Daryl in a dark closet for days because he wanted to break Daryl, but Daryl managed to escape. 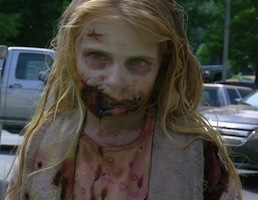 Negan uses zombies to protect the front of his compound and keep people out or to keep his people in. 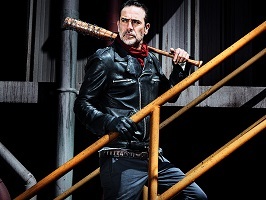 Below are The Walking Dead adult Negan Costume ideas. Eeny, meeny, miny moe. Catch a tiger by it’s toe. If he hollars let him go..My mother told me to pick the very best one..And you are…IT! Become everyone’s favorite sociopath – The leader of the Saviors. Costume includes signature jacket, red scarf and single glove. 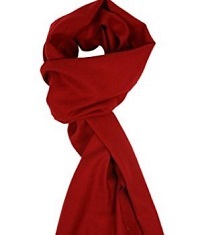 Add color to your sweaters, vests and outerwear in classic style and so soft to the touch. Red is Negan’s colour. 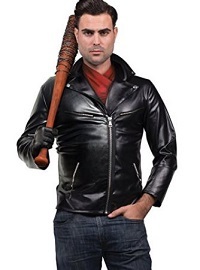 Click here to get Wakling Dead Negan Costume. Negan is definitely has the bad boy look down pat. He wears his leather jacket all the time. 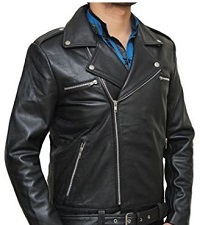 This is synthetic leather jacket that will make you look like the bad boy and not break the bank. 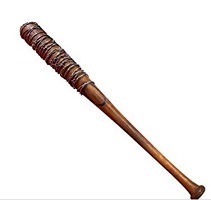 Click here to get Lucille. You don’t want to get your hands dirty or blood splattered when you pretend to kill your watermelon. Be prepared and wear your leather gloves while wielding Lucille and be careful of the seeds. Rusty Barbwire Cord. Costumed kids won’t snag when they cross paths with this realistic barbwire! This rusty, spiked cord is soft to the touch, but will definitely put a “sharp” touch on any Halloween haunt or Western-themed area! Wrap this nylon barbwire cord around railings or fence posts. If you already have a bat, just wrap this fake barb wire around your bat and you’re ready to call it Lucille. 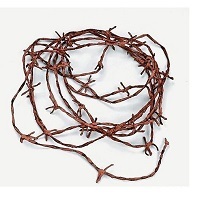 Click here to get the fake barb wire. 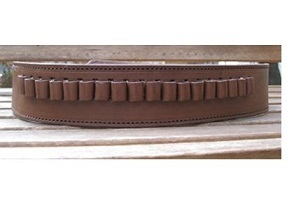 Negan has Lucille, but with all the zombies and enemies around, you can never leave the house without a gun or gun belt. 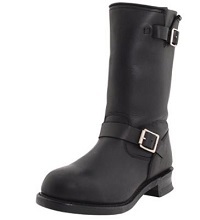 Look badass with these leather boots perfectly matched to Negan’s look in the Walking Dead. 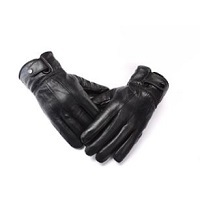 Click here to get Negan’s leather boots. Negan is supporting a white beard stubble. Complete your look by adding some white face paint to your face if you don’t have the luxury or time to grow a white beard stubble. 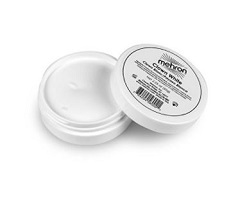 Click here to get the Negan’s white face paint.